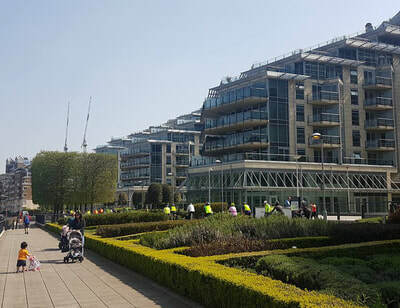 "18 of us set off from Peckham Square on a warm and sunny day going up the former canal path into Burgess Park. Round the lake then working our way via quiet back roads to New Kent Road. 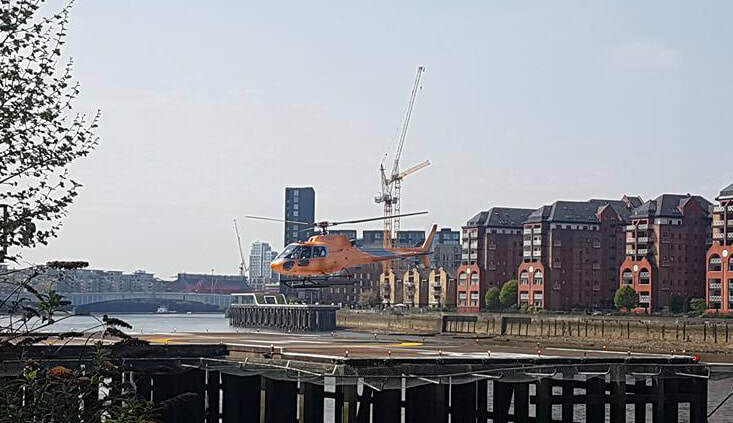 Across and up to join Q1 to Southwark Bridge road. Over the bridge and then straight on up into the City working our way through roadworks through a small gap unusually flagged up for 'Cyclists only'. Reached Look Mum No Hands where we took a coffee and snack break enjoying sitting out in the sun. Returned to Peckham by a similar route with a pause at the Guildhall as a rider's handlebars had worryingly worked loose. A bit of joint working and my multi-tool ensured the bars were safe enough for the return trip. Took the opportunity for a group photo! All safely back to Peckham after an enjoyable and relaxed ride. Thanks to Amanda for doing a morning recce ahead of me, David for being back marker and Tony and Amanda for helping on crossings. " 30 riders at Greenwich Foot Tunnel entrance on a lovely sunny morning. Headed off along the south bank route to Woolwich Ferry, then a wide loop past Royal Docks to the Greenway. Reached Cody Dock on the Lee for a well-deserved coffee break. Finally back via Millwall Docks and the Foot Tunnel to Cutty Sark. 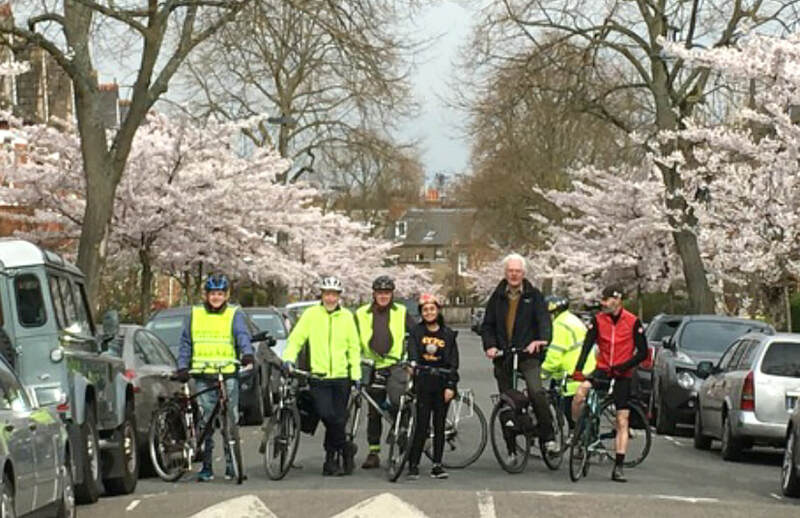 Full report by Ride Leader Amanda and best of pictures at https://southwarkcyclists.org.uk/cutty-to-cody-healthy-ride-report-19-may-2108/ Route below. 17 riders in Deal Porter Square ready to attempt again the heights of Hilly Fields. Weather dry but cool and overcast as we set off past Greenland Dock and across to Oldfield Grove. Over the railway to Deptford Park and Folkestone Gardens where we briefly joined Quietway 1. The new Deluxe Repair Station installed on the path next to the bistro, Festa sul prato, in Folkestone Gardens attracted much attention. The station has a pump, some tools and a bracket to lift your bike to eye level (see photo). Useful to know about these things. Decided not to use the New Cross crossings with such a large group, so continued to Margaret Macmillan Park, crossed the A2 to Florence Rd and joined the planned route at Vulcan Rd. From there a short climb to Wickham Rd and Hilly Fields. Had made excellent time, so took a coffee break, not something we usually have time for on a 2 hour ride. As usual chose the wrong path out of the park and ended up descending steps and right down at Ladywell. Picked up Nat Route 21 and followed this past the Lewisham Leisure Centre and through Brookmill Park, joining Quietway 1 again at Creekside. Took Q1 to Blackhorse Rd where we had a quick look at the canal bridge on Evelyn St as rumour had it a path was being opened as part of the new Timberyard Development. Alas, no sign of this yet, so the usual risky traversing of the A200. A controlled crossing is promised as part of the Cycle Superhighway 4 work, whenever this finally happens. It is badly needed. From Evelyn St used a route including the nice Surrey Canal Linear Path and then retraced the outward route past Greenland Dock and the Shopping Centre. Another Healthy ride completed, everyone a bit lighter and a bit fitter. Route at https://goo.gl/Ak8XmX or GPX below. Fine turnout of 17 riders at the Dulwich Clock Cafe on a bright, sunny morning. Headed off to Brockwell Park via Herne Hill - roads quiet but park already busy. Rode past the Lido round the north and west sides to the Tulse Hill Estate exit and from there continued on quiet streets to Emmanuel Rd and the north side of Tooting Bec Common. Followed Emmanuel Rd to the west end of the Common, then took the path down the west side past the Café and the lake. Stopped for a photo at the lake and briefly at Tooting Bec Rd where loos are available at the Athletics Track. Next headed east along Tooting Bec Rd and a had quick stop near the Lido before starting back. Return route home again mostly quiet streets crossing Streatham High Rd and passing close to Tulse Hill Station. Made very good time so did a circuit of Bel Air Park before using a short stretch of the South Circular (not too bad as cycle lane, then shared-use pavement) and entering the park at the Queen Mary's Gate entrance, handily close to the Cafe. Total length 9.5 miles. Route at https://goo.gl/eobvjv or gpx file on below. Just 8 riders at 10am in Peckham Square on a wet, cold morning. Set off sharp as it was warmer cycling than standing around. Up to Nunhead Cemetery where the path was full of large puddles from the overnight rain. From Nunhead Cemetery via the top end of Peckham Rye Park to Camberwell Old Cemetery where the paths were much better. Next along a surprisingly busy Wood Lane to Horniman Museum. By now the rain had stopped, but still pretty cold. Used the path just outside the park border that is London Cycling Network to get to Westwood Park. This path is not in great condition, but is easily cycled still, even in the wet. From Westwood Park continued to Brenchley Gardens and Camberwell New Cemetery. Another cemetery with rather good paths which took us out into Brockley Way. Along to the foot bridge over the railway from Turnham Rd and down to the last cemetery, Brockley and Ladywell. Part of this cemetery is wooded with an undergrowth of cow parsley and quiet a few bluebells. A rural oasis. From this last cemetery up Ivy Rd and through a short path to Hilly Fields. Everyone cycled up to the top where there are great views to the south, but the views north into Central London are largely obscured by trees. Last part of the route took us up to Nunhead, no time for a stop at Telegraph Hill, so straight on for the run down to the finish at Peckham Square. Finished on time and in the dry. Route at http://goo.gl/XzFkTD, or gpx below. We previously rode this route on april 21st, 2015, see report at http://healthyrider.weebly.com/healthy-ride-reports-april_may2015.html. "This is the ride rescheduled from March 17th when we were faced with heavy snowfall on the day. 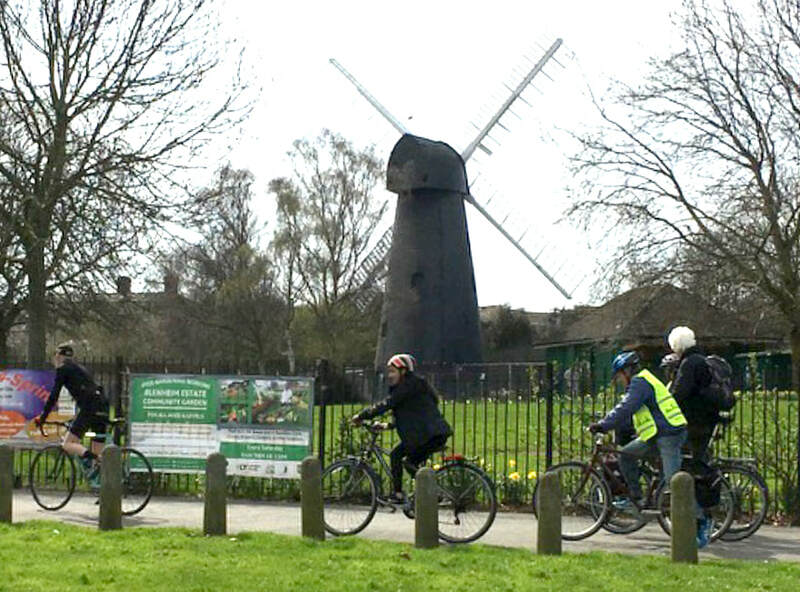 Today however, 24 cyclists left Burgess Park in bright sunshine with an unseasonably hot 24oC forecast and another 4 people joined us en route between Camberwell and Battersea (one of the advantages of publishing an accurately mapped route beforehand!). Down to Battersea Park along quiet roads, taking care to avoid some beastly potholes and crossing the river at Albert Bridge. Through Chelsea Harbour and along relatively new river- front developments and a nicely landscaped public park at Imperial Wharf and on to Bishops Park. After a 20 minute break for rehydration (and ice creams for some) we crossed Putney Bridge and followed the Thames Path back to Battersea and onwards to Vauxhall where we picked up CS5 and explored more quiet Kennington streets returning to the Chumleigh Gardens café with 10 minutes to spare. Bruce confirms that today’s total of 28 is the largest number of ride participants in 2018 and at 18.72 miles (just over 30 Km) the longest Healthy Ride + route so far. Considering the size of the group we kept together well throughout and made excellent time; welcome breezes along the river meant that it wasn’t as hot and sweaty as I had feared!" At last, a really nice spring day, light breeze, some sunshine, temperatures approaching 20 degrees. 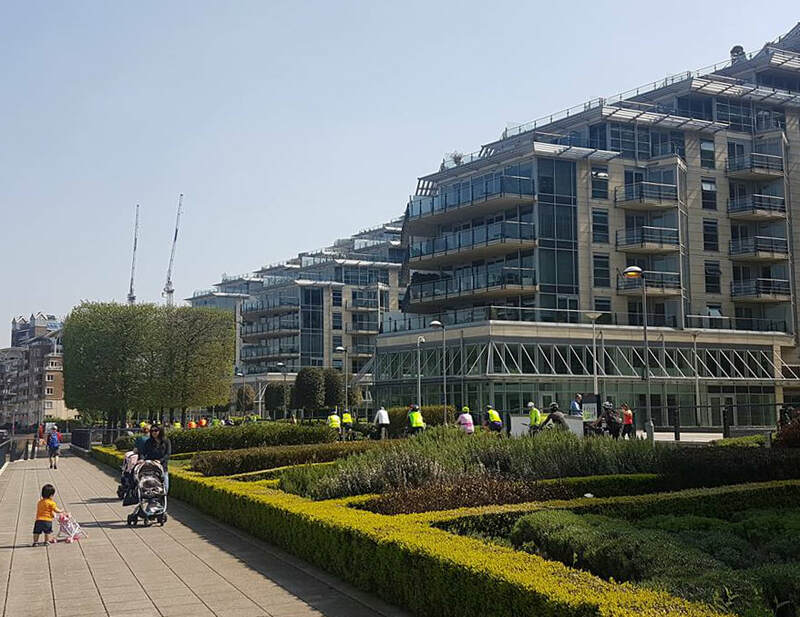 Not surprisingly we had an excellent turnout of 19 cyclists at Canada Water. Headed first down the Albion Channel to Surrey Water and our first view of the Thames. Then followed the river (National Route 4) to the South Bank at Bernie Spain Gardens. 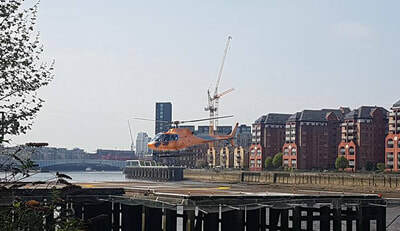 On the way paused at Cherry Garden Pier and admired the cherry blossom, navigated Borough Market (not quite as crowded as sometimes) and passed Tate Modern. 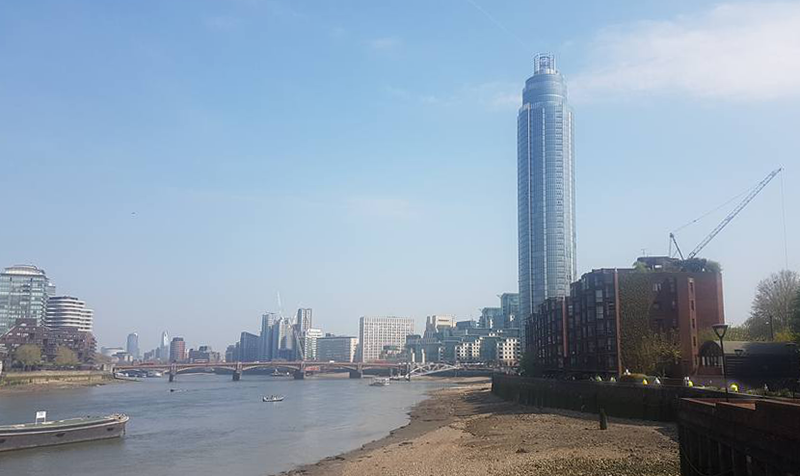 After a short break returned to Blackfriars Bridge and turned on to the N-S Superhighway (CS6) and had a clear run down to the Elephant bypass. Long wait at Newington Causeway as forgot to press the button, so no cycle green phase arrived! Then beside the railway viaduct to Elephant Road. As usual, crossed New Kent Road together with lots of pedestrians at a location that is crying out for a proper pedestrian crossing. In the Walworth Rd stopped at the "Five Ways to Wellbeing" event in Walworth organised by Cooltan Arts. Cooltan Arts is now located in the old Newington Library building. Checked the Southwark Cyclists stand then on to Canada Water via Salisbury Row, Quietway 1 and Southwark Park. Route at https://goo.gl/21cxWM or gpx below. Dulwich to Clapham Common. April 7th, 10am - 12 noon. 9 of us met up at Dulwich Park Cafe on a mild spring day. Out of park at the Gallery, then on to first stop at Herne Hill Velodrome. As usual some riders have never visited; they are always amazed that this velodrome exists and thrives. 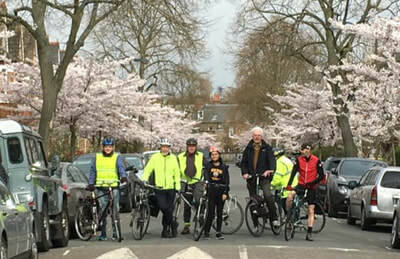 Next an unscheduled stop at Winterbrook Rd to admire the cherry blossom (see photo below). This quiet road has a perfect avenue of blossom at this time of year. Walked the crossings at Herne Hill junction to access Brockwell Park and rode round the northeast side of the park past the Lido. Turned sharp left to get to the exit to the Tulse Hill Estate from where we took back streets to Fairmount Rd. Crossed at the lights there to reach Brixton Mill. As with the velodrome, there are always riders who have never seen this beautifully restored windmill. From the mill picked up LCN25 to Clapham Common. Time for a good ride accross the Common and back. Went from the bandstand to Holy Triniity Church at the north corner of the park. Then back along the paths that are going to be Quietway 5 (no sign of this yet). Passed the boating pond and left the Common where we had entered at Narbonne Rd and retraced our outward route back to Brockwell Park. Entering Brockwell park we turned right and followed the border path round the west, south and east sides. Exited at Rosendale Rd which is another planned Quietway route (Q25), but again no sign of any implementation work. At the South Circular turned left on to this for 250m to the entrance to Bel Air Park. Quick circuit of Bel Air, out to Gallery Rd (very busy), struggled through the stile into Lovers Walk, then College Rd back to Dulwich Park. Super ride, nice warm weather, no mechanicals and lots of off road in parks. Route at https://goo.gl/gcbI5s. Previously ridden April 1st 2017, see report.